If Oprah Can Adopt a Dog, So Can You! Why buy a purebred puppy when you can adopt? Oprah did. She was on a waiting list, but she wanted a purebred dog so she waited. And just in time for your 56th birthday, two puppies with her requested breed came available and she adopted both. Sunny and Lauren are the most adorable 14 week old Springer Spaniels. They were adopted from PAWS Chicago which is a no-kill shelter. 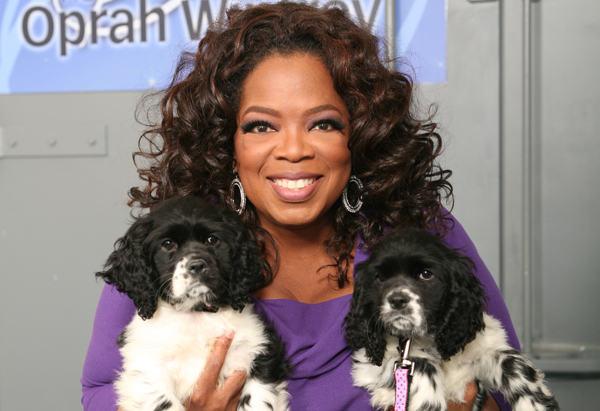 After showing her support against puppy mills on her show, we are glad to hear that Oprah takes her message home. Thanks, Oprah! 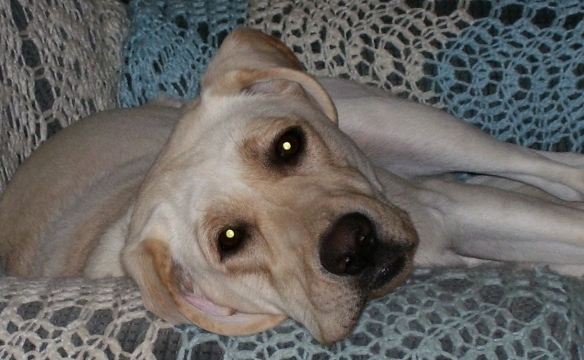 Maya, My Labrador Retriever, is the Most Popular Dog Ever! Per the AKC Registration list, Labrador Retrievers are the most popular dog. And they have been the most popular dog for years now. What about the mutt? (But, then again, doesn’t it seem that almost every mutt is a lab mix?) My dog, Maya, is a Labrador Retriever while my other dog, Sephi, is a Lab/Chow/Shepherd mix. 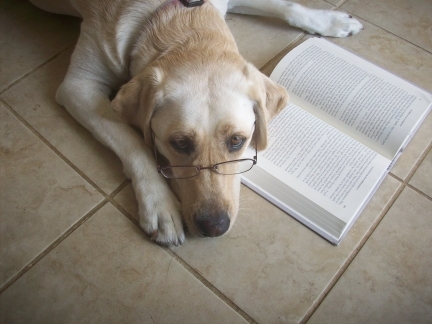 To read more about Labrador Retrievers, visit http://www.squidoo.com/aboutlabradorretrievers. While the Labrador Retriever is the most popular dog in America, the German Shepherd came second, and the Yorkie third. Following these are the remaining top ten – Golden Retriever (4), Beagle (5), Boxer (6), Bulldog (7), Dachshund (8), Poodle (9), and Shih Tzu (10). The AKC has also listed the most popular dog breeds by major US cities. To read more on the AKC statistics, visit http://www.akc.org/reg/dogreg_stats.cfm. Shelter dogs are on the run! With a plush squeaky toy or other dog toy in their mouth they are running for a touchdown on the miniature puppy play field. There will be tackles as puppies rough and tumble and fight for the toy. Penalties or time outs will be called if the game gets too rough or if a puppy pottys on the field. There will also be offense, defence, first downs, instant replays, and more. Last year, the National Anthem was sung by a talented parrot named Pepper. Was that for real? I think it was. Will she sing again this year? Not if she was adopted and I hope she was. The Kitty Half-time-Show will be featured again with kittens having a blast with balls of yarn, toys which look like, mice, balls with bells inside, or other fun kitty toys. This year will feature a bunny cheerleaders! I can’t wait to see that. This year’s puppy line up includes twenty adorable puppies who look ready to play: Bandit, a sweet-looking Border Collie mix; another puppy named Bandit who is a Husky mix; Blaze, an Australian Shepherd mix; Carson, a perky little German Shepherd mix; blue-eyed Chamomile, a Boxer mix; Chloe, a yellow Lab mix; Duncan the Beagle; Naome, an interesting mix of Akita, Lab, and Boxer; Jumby, a spunky looking Pomeranian; Addison, a cute little Yorkie/Maltese mix; Coco, a Boxer mix; and more. Check out the puppy line up and review the Puppy Bowl from previous years at http://animal.discovery.com/tv/puppy-bowl/puppy-bowl.html. Read about Puppy Bowl VI at http://animal.discovery.com/tv/puppy-bowl/about.html. This show isn’t just for entertainment. It helps educate the public about homeless pets. Don’t forget to watch this year’s Puppy Bowl VI on Sunday, February 7th, 3-3PM Eastern/Pacific time on Animal Planet. And don’t forget to donate to your local animal shelter and ADOPT a dog rather than buy. Don’t be fooled by those sad-looking eyes and droopy face. Basset Hounds are happy-go-lucky dogs. They are very affectionate and great with people and children. Basset Hounds are also very easy to take care of. They require little exercise and minimal grooming. About the only thing to be concerned about when it comes to regular car is their nails. You must keep them cut, especially if the Basset Hound is primarily indoors. You also have wipe their faces on a regular basis as they tend to drool. 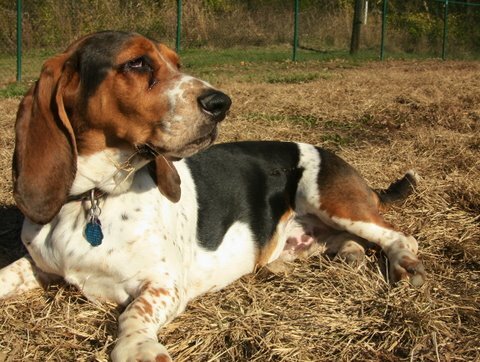 To read more information about Basset Hounds, check out this article for “Great Information on Basset Hounds” from PetAutoSafetyBlog.com. Also, if you are thinking about getting a Basset Hound, consider adopting one instead. Dogs, even purebred dogs, are given up to shelters all the time, often for something as simple as the family moving or the family just not having time to care for a dog. Contact your local shelter and ask if they have any Basset Hounds for adoption. If not, ask if they know of any Basset Hound rescue groups. A rescue group generally keeps the animals in their own home until adopted. This means that they will know a lot more about the personality of their dogs and they will be able to help you get a Basset Hound right for your family. A Basset Hound rescue group will insist the dog is fixed before it is adopted, but that is what you want anyway. No need to breed more dogs. There are already millions of homeless dogs living in shelters right now. Check out this great website called Muttigrees.org. We love this site. Not only do they have a lot of great information, but they also promote adopting a mixed breed dog instead of buying a pure bred dog. There are millions of puppies being brought into this world and not enough homes for them all. So millions of dogs are being euthanized each year. And sadly, many of the dogs being euthanized are mutts. Unless you research your breeder, you could be buying your dog from a puppy mill or from an irresponsible backyard breeder. Both types of breeders are likely to breed without doing background health checks on the parents and could be inadvertently breeding more dogs with inherited health problems. Worse than this, is how the dogs in the puppy mills could be living. While you may be buying a puppy and giving it a good home, its mom could still be living in a tiny cage and giving birth to more puppies which may or may not end up living in good homes. It is very sad and it has got to stop. So please, adopt a dog or do thorough research on the breeder before you buy a dog. If America stops buying dogs, puppy mills will go out of business and back yard breeders are less likely to breed their dogs in order to make a fast buck. Join the Muttigrees Club like we have and support adoption of all dogs – mutts and purebreds alike. My dog, Sephi, seems to shed all year around. Even now in this cold weather, she is leaving her black hair everywhere. Why? Well, she is mostly an indoor dog. And because she is mostly an indoor dog, I have to deal with her hair everywhere all year around. So what do I do? I brush her almost every single day (about as often as I sweep the floor). I also use a special brush in order to get the undercoat. For more great information on what to do to curb dog shedding, check out the article, “Help! My Dog is Shedding Like Crazy!” written by Joanne Wood-Ellison. If you are a hunter and have considered getting a great hunting dog, consider the Wirehaired Pointing Griffon. This dog can be trained to track, point, and retrieve. He is a hardy breed and can hunt in all kinds of weather. And he is easy to train because he is an eager to please sort of dog. Be careful if you are considering the Wirehaired Pointing Griffon for a family dog. This dog requires lots of exercise and mental stimulation. For more information on the Wirehaired Pointing Griffon, check out this article at PetAutoSafetyBlog.com. Animal Figurine Store.com has recently added new puppy figurines. Check out the puppy figurine pot hangers. What are pot hangers? Pot hangers are animal figurines designed to hang off the edge of your potted plants. Notice the above photo of an adorable puppy figurine which looks like he is climbing into a potted plant. These puppy figurines come in a few selective breeds such as the Rottweiler puppy figurine, Spaniel puppy figurine, Westie puppy figurine, Yorkie puppy figurine, Shar-Pei puppy figurine, and more. Most of these puppy figurines are about 3″ high, 2″ wide, and 2″ long. 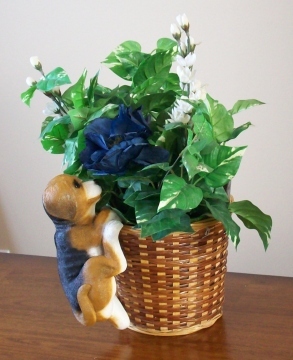 But there is also a larger puppy figurine pot hanger of the Beagle. It is about 8″ high, 4″ wide, and 4″ long. Oh, and there is also a few cat figurine pot hangers. They are slightly smaller than the smaller puppy figurine pot hangers, but they are just as adorable. Visit the dog and cat figurine page from Animal Figurine Store.com and select the appropriate group depending on your favorite dog breed or cat. Nothing is worse than losing your pet. And if you lose your pet because they got out of the fence or got off their leash, it is even more difficult because you don’t know their fate. Check out this great article we found from That Mutt: A Dog Blog about Ways to Prevent Losing Your Dog. Read the comments too. Lots of visitors to that site made some great comments.